I am excited and honoured indeed to be joining an esteemed list of bloggers and makers joining in the July 2016 Vintage Pledge guest EXTRAVAGANZA. It means a lot to me because without joining the vintage pledge last year I don't think I would have improved so much as a dressmaker without the inspiration it gave me. 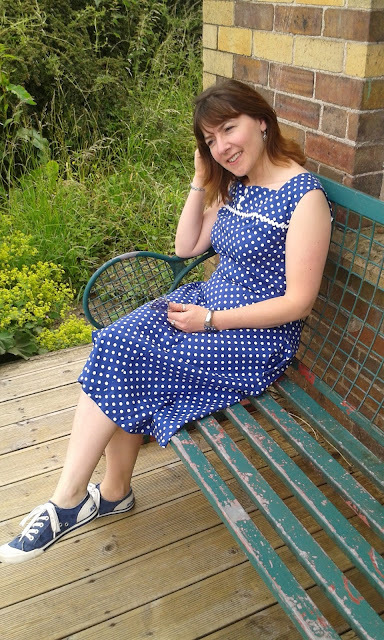 I had been an admirer of vintage patterns because I liked the artwork but now I can truly say I am a maker of a wonderful wardrobe full of them thanks to the Vintage Pledge 2015 and 2016. 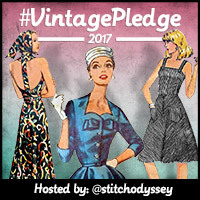 My 2016 vintage pledge this year over at Stitching Odyssey and Kestrel Makes was to try to use an unmarked vintage pattern. You know, a little challenge to myself, a little step up. I love this pattern and have avoided it for over two years now because it is devoid of printed pattern markings and that is a bit scary. ...I got a little bit frightened about putting on a collar and button band with out any markings. I knew it would be possible but I kind of chickened out. 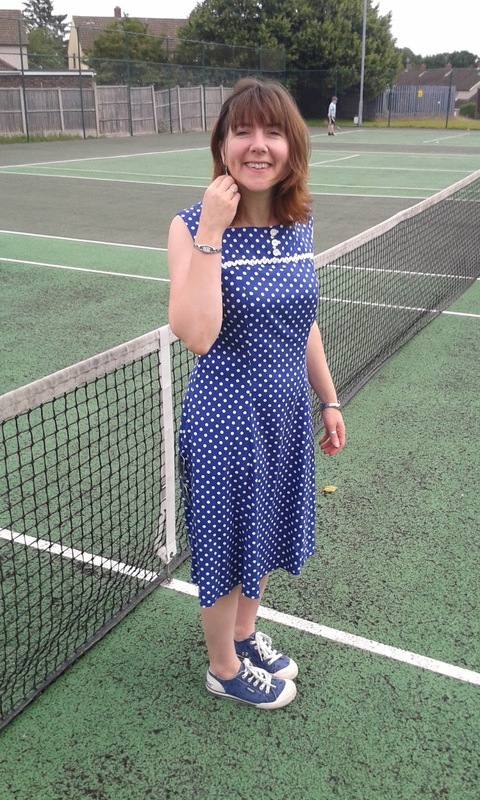 No matter, as the other tennis dress was really beautiful too. The square neckline attracted me because I didn't have anything like that in my wardrobe. So I cracked on cutting out and marking every tiny hole. 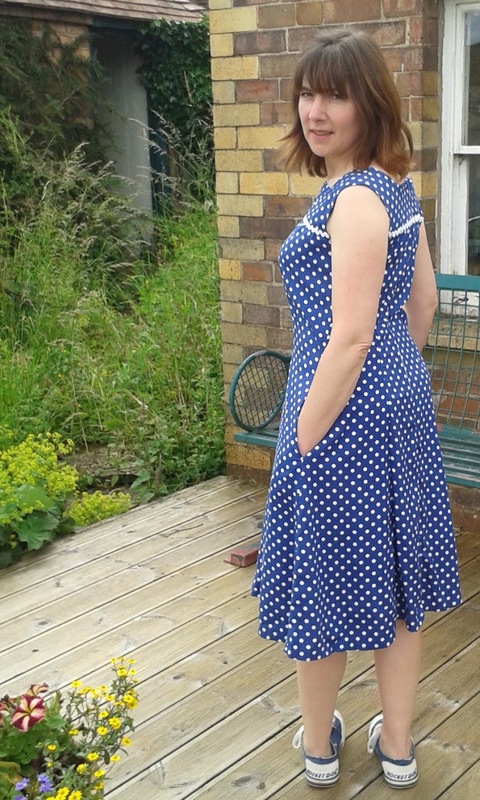 I tacked the whole dress together. That is how I have been working recently. I have only ever made one toile in my life and that was a self drafted pattern. Tacking a whole outfit works for me because I have made so much now that I have a good idea of what I need to alter when I cut right at the start. 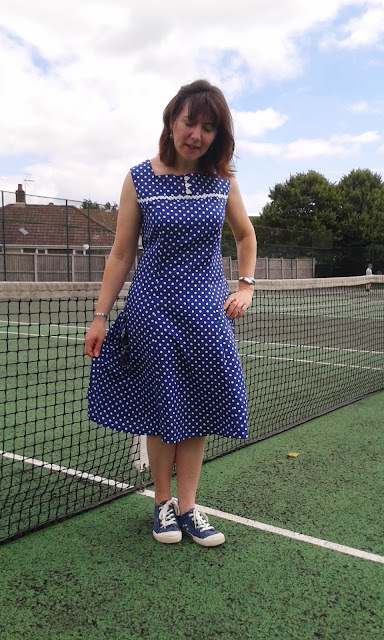 I also made it longer because I was not going to be playing tennis in it even with those big ball pockets stood on a tennis court! Lengthening was a strange phenomenon because I usually have to shorten things. The fabric is a thick viscose with a lovely drape purchased from the stitching show last year at the NEC in Birmingham. The grand purchase total being £12.00. At the end I added on the ric rac because I am a sucker for the stuff and the buttons are shown as on the pattern. I added three purely because there were three in the packet. Will I be tackling another unmarked pattern? I wouldn't specifically hunt one down but if I really liked a pattern/design/image, it wouldn't stop me from having another go. 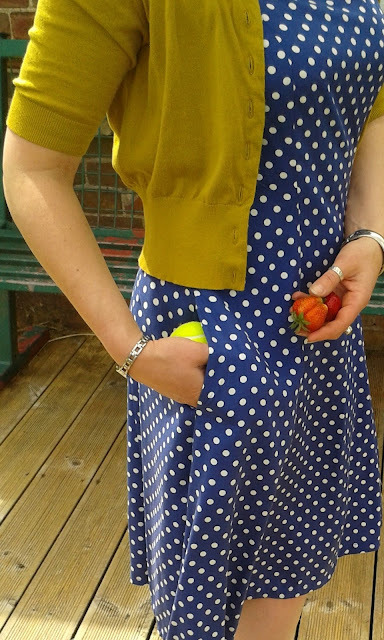 Do join in with the pledge if you haven't already - it could be something as simple as a skirt to get you going or you could end up like me and make nearly all of your clothes from Vintage patterns by then end of the challenge. My motivation to sew more generally definitely started with the Vintage Pledge back in 2015. It really has been an inspiration. We are off on holiday for a week now to Portugal. 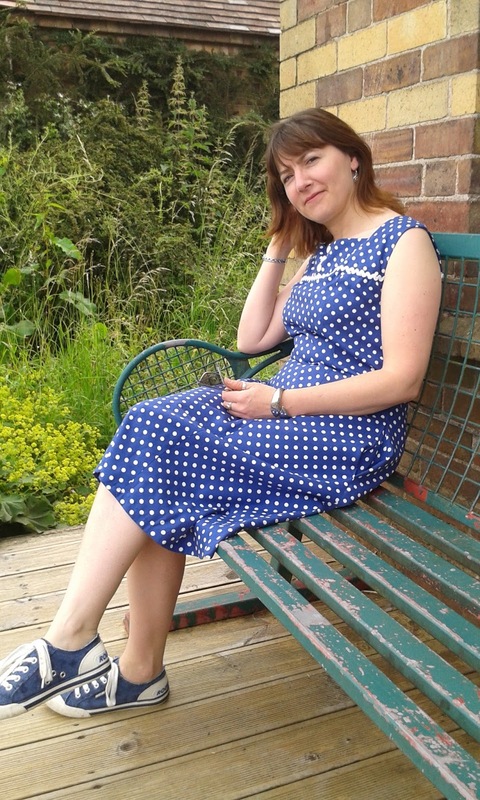 Our first flying holiday as a family, the children are excited, I am looking forward to some sunshine and this dress is going into my suitcase. There are rumblings on a few blogs about sock yarn blankets, much respect to you all but I am a thrill seeker, knitting a blanket in sock yarn leftovers will never be on my list of things to do. So I just started to crochet my leftovers instead and a pleasing combination of rows appeared before my very eyes. I was surprised with the combination in crochet as opposed to the yarn balls in the first picture.It was better so much better than I thought it was going to be. I will keep you guessing though because I am not sure what it is going to be yet but I needed something easy to crochet on holiday. 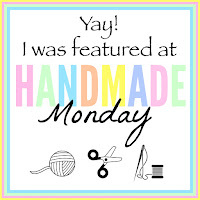 This month I chose a beautiful cotton fabric from Minerva to make a shirt. I wanted to hone my collar skills so I went for a simple shirt design from the GBSB book One, yes people, I am still on book one! 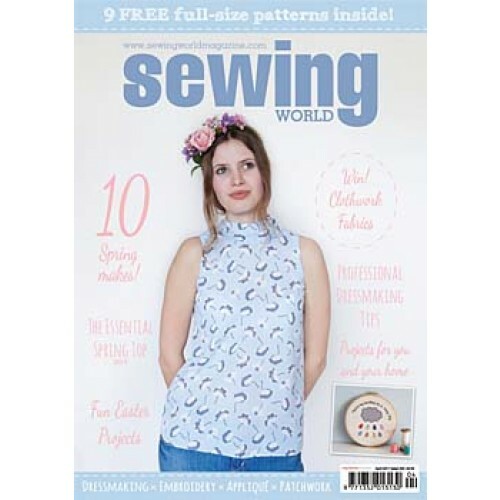 There are so many useful patterns in it I haven't felt the need to buy another sewing book until I had thoroughly enjoyed using the first one. Ta dah! 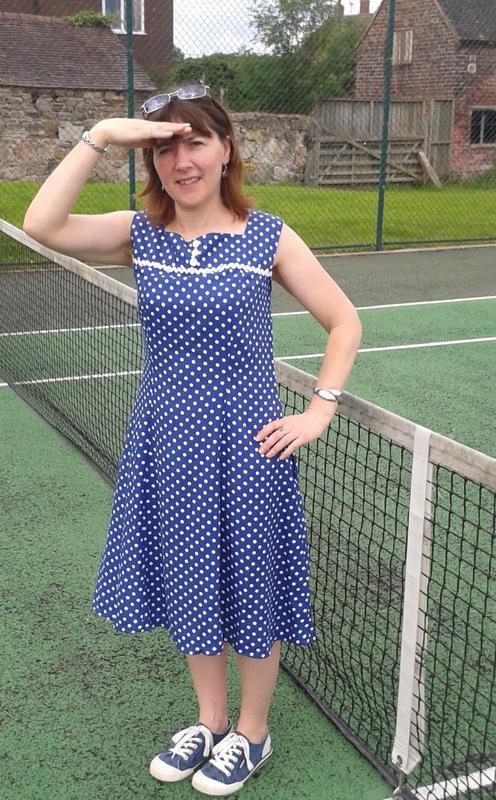 I invite you to admire my pattern matching which was a bit GBSB too. It is called the Boyfriend Shirt and is perfect for weekends and when I am working from home. The pattern is by William Morris, it is pretty timeless. 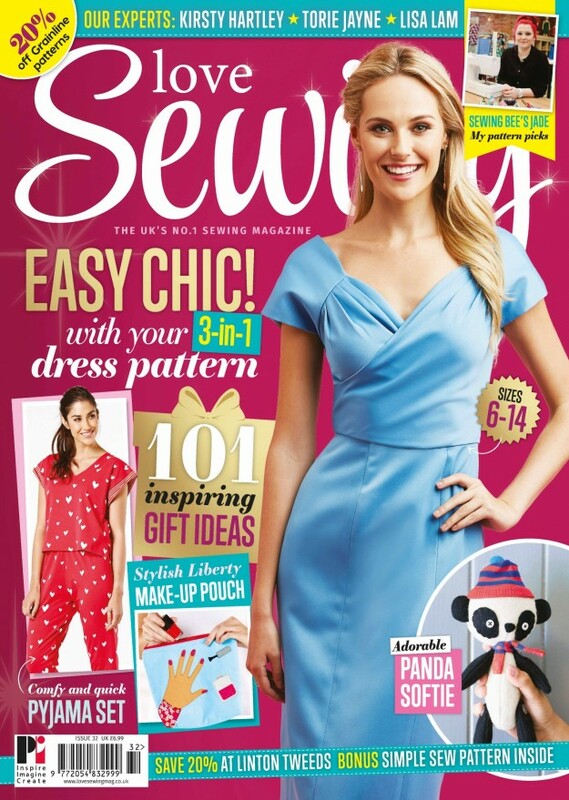 Unfortunately they have sold out of this pattern but they have other classic patterns to try. There are no cuffs to deal with so it is a good project for a first shirt. The birds follow across the front and round the sleeve heads - so very proud of myself. I am going to wear this shirt for years I can feel it. The cotton was a good weight and soft to the skin. It would have made a pleasing skirt, shift dress or vintage style gathered skirt dress. I doesn't drape so it is good for things which cry out for a nice stem press and a crisp finish - like this shirt. After the success of making a replica blouse of an old favourite I decided to repeat the process again. This is an old blouse - how old I do not know because I bought it from a second hand vintage shop eight years ago. It was when Big Sis was not a sister, she was a lonesome baby and I bought this East blouse because it was good for breastfeeding and fitted my post pregnancy bigger frame at the time. It does however have a beautiful embroidered centre piece at the front which was what stopped me putting it in the recycling bag.I also liked the relaxed peasant style for summer days when I don't want both my arms and legs out at the same time. I made a toile out of a duvet cover after cutting up the old blouse to gauge a smaller fit. All looseley tacked so that I could rip it out easily after fitting. Check. These became the new fabric pattern pieces ready for some new sparkling white embroidaise anglais fabric which I had left from my last blouse. Ta dah! A new peasant blouse which is really easy to wear and has saved that lovely piece of embroidery. Perfect for today when the UK had a scorcher and I had seen enough sun on my arms, especially my car driving right arm which is a touch rosy. Perfectly floaty and comfortable for the school sports day today - Ouch! Hot by you today? I have really enjoyed a bit of crochet lately. I have made 30 squircles ready to attempt my first join-as-you-go project. I have ran out of sizeable balls of leftover yarn to join the whole thing together but I have my Aunt on the case. She is bringing me some stylecraft yarn on her next visit to make it pop and complete this Baby Boy Pram Blanket. I have shared this brilliant idea before. It is my blocking board. Oh yes, people I am blocking-as-I-go too. My bloke made it from a piece of broken chopping board. He drilled four holes and popped in the new (unsharpened) pencils. Every time I complete a square I gently stretch it on, give it a light water spray and leave it a few days before removing and then adding more. I am being a bit deceptive here, the ones on the right have all the ends pointing towards the window in case you think I am a complete goody two shoes! We have found this rather natty way of starting the weekend. We all agree that we are going to sleep at the cabin on Friday night. Bloke picks the children up from after-school club, I get home shortly afterwards, we all change into farm clothes, then drive past the Chinese takeaway and pick up dinner to eat at the cabin. The children stay up later than normal. We play, we unwind together, watch the sunset and the lights come on in the distant town then go to sleep to the strange animal noises that accompany us at the farm. I usually manage to sneak in half an hour of crochet. The next morning we eat breakfast, have a bit more playing time then pack up, go home and have a shower. Miraculously we still have the whole weekend to go! The photo on the right is purely for my memory, I spent the best 90 minutes of my life last weekend with Little M totally engaged in spotting, drawing and using a nature book to find the names of these wildflowers. I love the way she has written the date, she felt so grown up when she did it. We think the purple one is selfheal not shelfheal when we cross referenced it later. We have done it twice now and it really has been a huge success to enjoy the lighter nights even if it has not been really summery. We have been hitting the puddings hard of late. I am in a pleasant but constant battle to continually use our chickens eggs and home grown summer fruit. Last week we ate a pavlova and a tiramisu. This week we are eating a lemon meringue pie and home made strawberry ice-cream! We have been picking redcurrants, blackcurrants, raspberries and the last of the strawberries. This week the tayberries are making an appearance and I don't even know what to do with those! Roll on another week of hip busting desserts. I make a quilt and I think that will get rid of all of my scraps and then I realise I have managed to fill up the boxes again. When I questioned this, bloke replied without looking up, " but you keep making more stuff so you will keep getting more scraps!" He is so right that astute, handsome bloke. As with all my quilts to date I simply started cutting, no plan, no colour musings just getting rid of clutter seems to be the main criteria for my quilting. I love the feeling of not wasting a single scrap of fabric and of being completely at the mercy of my own creative mind. Firstly I was optimistic about quantity, I always am, then I got a bit bored cutting and ran out of sizable scraps my template would fit on. I accidentally ordered some charm packs to mix in from prettiful fabrics. It goes completely against my reasons for making a quilt(patchwork is to use up scraps in my world)but I was caught in a weak moment. They are a bit traditional but so reasonably priced 10 x 5" inch squares were only £1.40. I have never used this company before but I was mighty pleased with my parcel. I'll keep you posted, but I have been heavily influenced by Christina from A colourful life by which I mean I am totally stealing her quilt idea! I had a few minutes here and there when I just wanted to sew in straight lines without fitting a bottom or a bust shape... I washi taped it to the wall and am pleased with the results so far apart from the yellow corner. I have used my favourite work trouser pattern, Simplicity K1699, to make another pair of trousers. 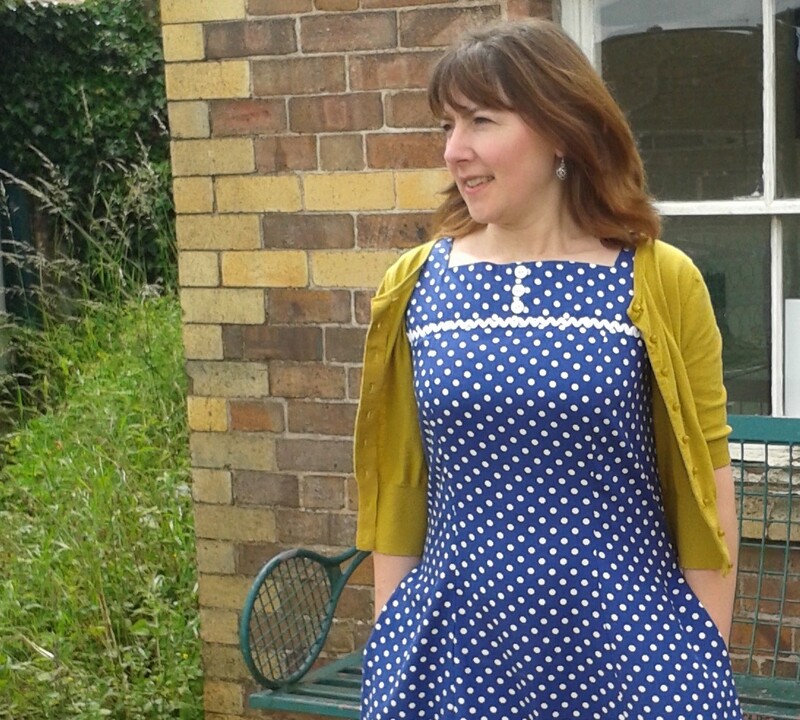 This time from a remnant of pink chambray I bought for £5. I have lots of things I can wear with them including my DM sandals. 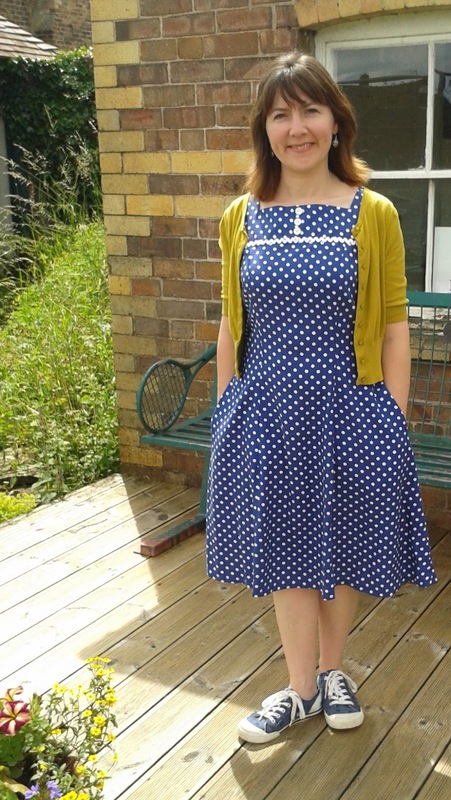 I put in the best invisible zip ever by using this tutorial from Sew Over it followed by her one on how to finish the bottom of the zip - it is spot on without the little pimple I used to get. I worked hard on the fit for the hip to waist ratio which I have so much trouble with in ready to wear clothes. 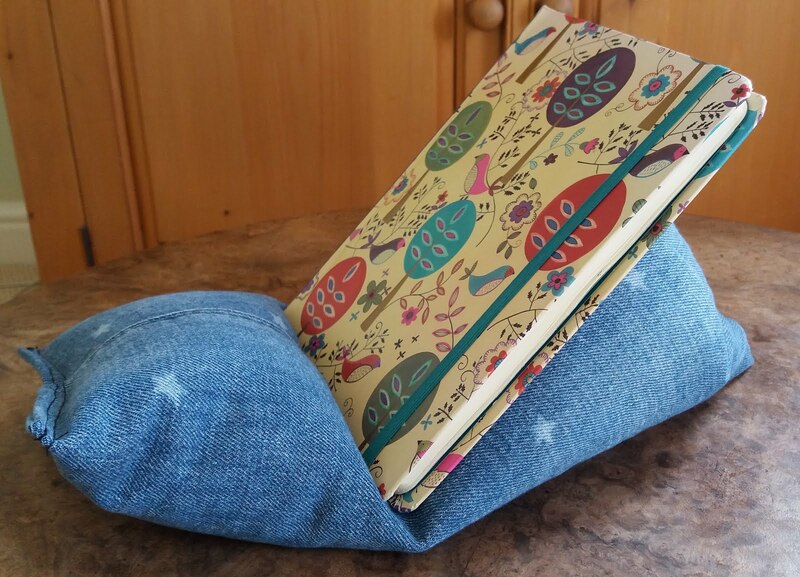 They need one more press down the seams now that the fabric has relaxed a bit. I think these will be great for the not so summery days we are having this Summer here in the UK. This gorgeous little make was all made with free little bits and pieces that came with compliments. The patchwork flower pieces were stapled to an invoice from Lina Patchwork. It was really small. The liberty fabric swatches (about 8cm square) came with compliments from Alice Caroline when I ordered half a metre of Liberty to make my twin set. I wondered what I was going to do with them and now here they are meeting up with someone else's kindness. I used my glue pen to cover the paper pieces and then had a happy half an hour doing teeny weeny stitches to join it all together. I popped in two bits of Liberty from which I have made clothes to make the full flower. Finally, the hoop was a free gift on a magazine which my Aunt did not want so she gave it to me. All totally free and fun. It is joining my ever growing gallery of hoops at the cabin. How small do your scraps have to be before you throw them away? Where is the wool Jo?